Ireland pictures of Funerals, Irish Historical Pictures of Funerals, Irish Vintage Photographs of Funerals, Old Ireland Photographs of Funerals, old photos of Funerals, old pictures of Funerals, photo history of Funerals, photographs of Funerals, photos of Funerals, Irish historic images of Funerals, Irish historic photo of Funerals, Irish historic photographs of Funerals, Irish historic photos of Funerals, Irish historic pictures of Funerals, Irish historic sites of Funerals, Irish historical images of Funerals, Irish historical pictures of Funerals, Irish history of Funerals,pictures of Funerals, Irish history photo of Funerals, Irish history photos of Funerals, Irish history pictures of Funerals. 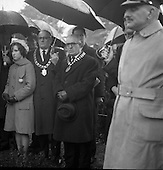 1963-02/02 Cardinal D'Alton Funeral. 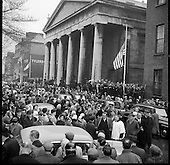 Cardinal D'Alton funeral procession moving along crowd lined O'Connell Street. Various shots of the flags at half mast around Dublin, Ireland on top of the GPO and in O'Connell Street marking the death of Cardinal D'Alton. 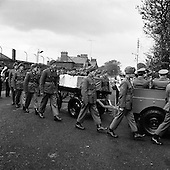 Various shots of the large funeral procession moving along crowd lined O'Connell Street. Cardinal D'Alton lying in state in Armagh Cathedral. People moving past coffin.